Skip the scooping and make your chocolate chip cookies in a pan instead! 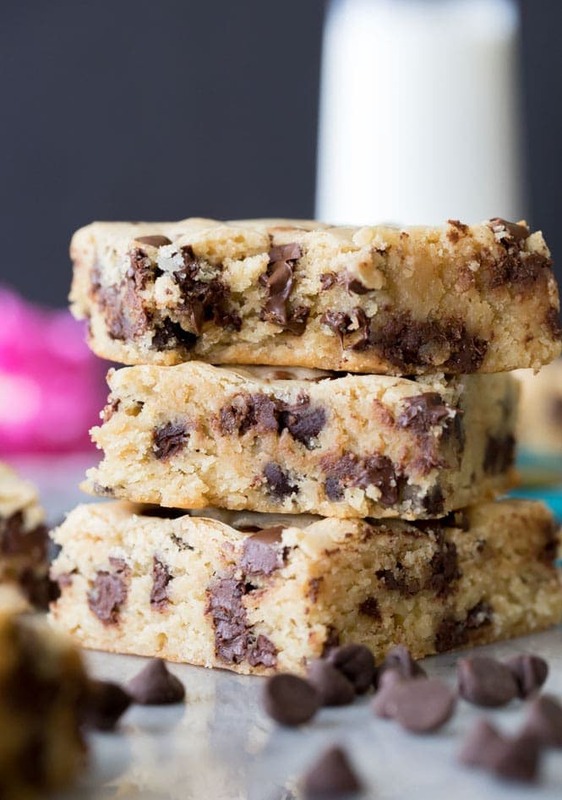 These soft and chewy chocolate chip cookie bars are an easy-to-make treat loaded with melty semisweet chocolate chips inside a buttery soft cookie bar! No chilling or scooping required! 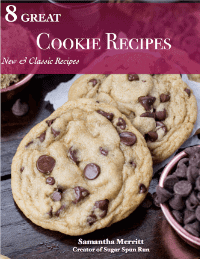 Recipe includes a brief instructional video on how to make chocolate chip cookie bars! 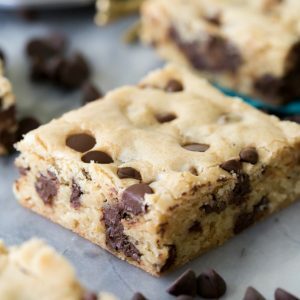 I should’ve named these chocolate chip cookie bars “Lazy Bars” because growing up, that’s exactly what they were to me. I know I mentioned before that I grew up baking as much as I possibly could, but to be honest my love of baking didn’t start so much as a love of the actual process as it did as a love of stealing unsupervised spoonful after spoonful of raw cookie dough or frosting (or whatever was on my radar for that day). Chocolate Chip Cookies were always my favorite, but when it came to actually baking the cookies I always either tried to bribe my sister into doing the work of scooping and baking them or I would just pour the batter into a pan and bake the cookies that way. Easy and done. And while you can generally just take any chocolate chip cookie recipe and bake it into a pan and call it a day, I found that this technique usually yielded less than totally desirable results. The bars were usually too tough, too crumbly, too unsatisfying after being baked. I wanted soft, chewy, and buttery chocolate chip cookie bars, and that method left a lot to be desired. Melted butter (rather than softened) that coats every molecule of the cookie dough for the best, butteriest taste. More brown sugar than white for more moisture and better flavor. The result was the best chocolate chip cookie bars I’d ever made. Just as soft, chewy, buttery, and delicious as their cookie counterparts, but no scooping (and no chilling!) required. Please note that because of the changes that were made, this cookie dough can’t be used to make actual cookies and only works when baked in a pan, trying to scoop and bake them would leave you with cookie pancakes that spread all over your cookie sheet! If you enjoy these videos, please consider subscribing to my YouTube channel. Preheat oven to 350F (175C) and prepare a 9x13 pan by lining with parchment paper (or lightly grease and flour). Combine melted (cooled) butter and sugars in a large bowl, stir well. Add eggs, egg yolk, and vanilla extract and stir until well-combined. In a separate, medium-sized bowl, whisk together flour, cornstarch, baking powder, and salt. Gradually stir dry ingredients into wet until completely combined. Stir in chocolate chips. Spread batter evenly into prepared pan. Bake on 350F (175C) for 25-30 minutes or until edges just begin to turn golden brown. This recipe can also be baked in a 9x9 pan but will need to bake about 5-10 minutes longer. I wanted to make these for my husband’s lunch box and remembered I was out of eggs! You can substitute applesauce for eggs! They turned out awesome! 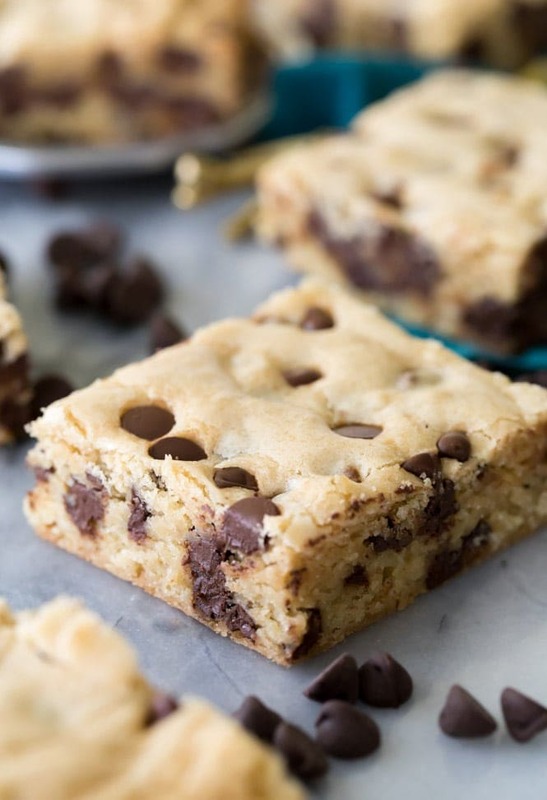 I’ve been baking for my big family for many years and these chocolate chip bars are THE BEST! Absolutely perfect. It’ll be the only one I use in the years ahead. Thank you for sharing this keeper! Amazing!! So easy to make and so tasty!! Huge hit in my house! 😀 Thanks for sharing! I feel compelled to start with OMG like other reviewers, these bars are seriously that good. I had never made a bar type cookie but I ran across the idea on another page(Tollhouse) but their review were terrible. So I landed here somehow and boy I’m sure glad I did. This recipe is a hit! I made it in a heart-shaped pan for Valentine’s and my coworkers and family gobbled it up. Thanks! My family loves how chewy they are. MADE them at Christmas and were a hit. They were kind of hard in 2 days covered with plastic wrap. Saw you make these on the Kitchen. Hi JoAnn! was the plastic wrap airtight? They should be able to keep longer than 2 days before losing their softness. MADE these at Christmas and were a hit. My husband likes how chewy they are. Saw you make them on the Kitchen. They were kind of hard after 2 days COVERED with plastic wrap. Made a couple times now and they don’t come out done… Checked my oven temp and it’s right on. Also seems heavy on the chocolate chips, and I say that as a fan. Still delicious. Am making a double pan to send back to college with my son. He and his buddies will devour them tomorrow during Super Bowl! Thank you so much for the easy recipe. It came together quick and tastes great! I am so glad everyone enjoyed them, Chris! 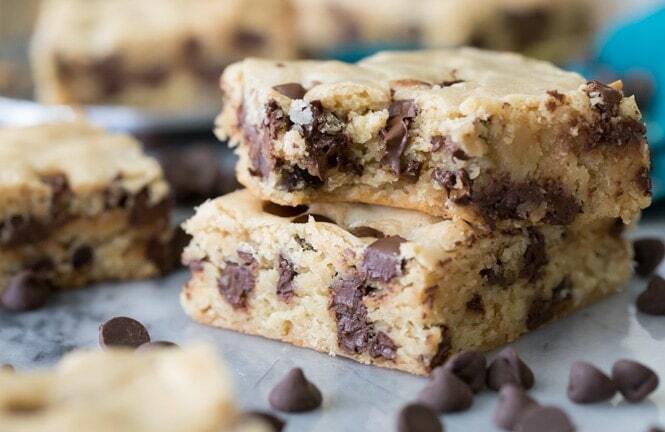 OMG, these cookie bars are amazing. I make them for my high school kids that have been out shoveling and just loves the warm surprise when they can in!! Will definitely be making them again, thanks for sharing!! I sort of made these yesterday and they were fantastic! I did not melt my butter, room temp, used 3 whole cold eggs and 60% bittersweet chocolate! Yum! Thank you Sam! I would like to adapt this to a recipe using quick oats and cookie butter. Could I just add those to this recipe, or do I need to tweak some things? OMG … just made these. Absolute perfection! I have been looking for a decent chocolate chip cookie bar for ages. I will look no further! Thank you, thank you, thank you for sharing this recipe!!! Just pulled these out of the oven, baked for my grandkids lunches. I had to try a corner and OMG, these are amazing! I have stopped looking for an easy chocolate chip bar. Your changes are spot on. I want to freeze these so that my grandkids can have them for their packed lunches. How well do they freeze? Thank you.